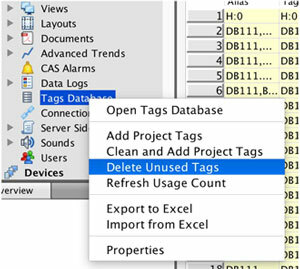 As your project grows, the tag database can also get larger. Some of the tags listed in the tag database may no longer be needed. You can delete unused tags simply by invoking the command Delete Unused Tags. To do so, right click on the Tag Database in the project. A popup menu is shown; now select Delete Unused Tags. All tags with reference count = 0 (e.g. not used) will be removed.